When in Lisbon, make a side trip to see Quinta da Regaleira in Sintra, approximately 36 minutes away. Dedicate the 6th (Wed) to wine at some of the top wineries in the area. There's lots more to do: admire nature's wide array of creatures at Lisbon Oceanarium, wander the streets of Alfama, pause for some photo ops at Padrao dos Descobrimentos, and admire the masterpieces at National Tile Museum. To find ratings, reviews, maps, and more tourist information, go to the Lisbon online travel route planner . Rio de Janeiro, Brazil to Lisbon is an approximately 13.5-hour flight. You can also do a combination of bus and flight. Traveling from Rio de Janeiro to Lisbon, you'll lose 3 hours due to the time zone difference. While traveling from Rio de Janeiro, expect slightly colder days and colder nights in Lisbon, ranging from highs of 21°C to lows of 11°C. Finish your sightseeing early on the 7th (Thu) so you can drive to Lagos. 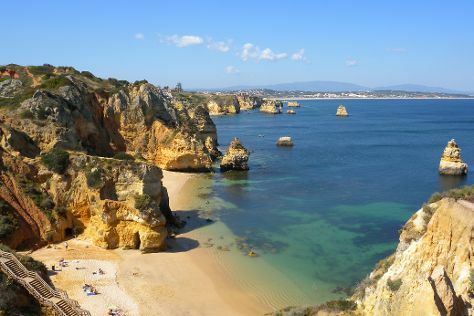 You'll find plenty of places to visit near Lagos: Cape Saint Vincent (in Sagres), Praia Da Rocha (in Praia da Rocha) and Percurso dos Sete Vales Suspensos (in Lagoa). Pack the 10th (Sun) with family-friendly diversions at Zoomarine Algarve - Theme Park. The adventure continues: take in the dramatic natural features at Ponta da Piedade, explore and take pictures at MRFrutas - Citrus growers, get outside with Pro Putting Garden, and stop by Casa do "Vo" Serafim. Inspirock's itinerary builder makes planning a Lagos trip simple and quick. Drive from Lisbon to Lagos in 3 hours. Alternatively, you can take a bus; or do a combination of flight and bus. In November, plan for daily highs up to 23°C, and evening lows to 14°C. Wrap up your sightseeing on the 11th (Mon) to allow time to drive to Tavira. Step out of Tavira with an excursion to Dias de Aromas in Estoi--about 38 minutes away. And it doesn't end there: get up close to creatures of the deep with a dolphin and whale watching tour, get engrossed in the history at Igreja do Antigo Convento de Santo Antonio dos Capuchos, take in the waterfront activity at Marina de Vilamoura, and try for a hole-in-one at Tavira Mini Golf Fun Park. To find reviews, traveler tips, and more tourist information, read our Tavira route builder . You can drive from Lagos to Tavira in 1.5 hours. Alternatively, you can take a bus; or take a train. In November in Tavira, expect temperatures between 22°C during the day and 14°C at night. Cap off your sightseeing on the 15th (Fri) early enough to go by car to Evora. Evora is known for historic sites, museums, wineries, adventure, and parks. 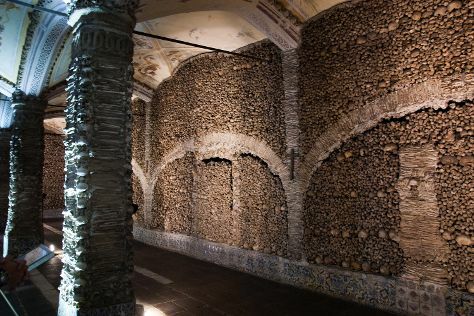 Your plan includes some of its best attractions: contemplate in the serene atmosphere at Capela dos Ossos, steep yourself in history at Cathedral of Evora (Se Catedral de Evora), enjoy the scholastic atmosphere at University of Evora, and get a dose of the wild on a nature and wildlife tour. For reviews, photos, traveler tips, and tourist information, read our Evora trip itinerary maker tool . You can drive from Tavira to Evora in 3 hours. Other options are to take a train; or take a bus. Traveling from Tavira in November, plan for a bit cooler nights in Evora, with lows around 9°C. Wrap up your sightseeing on the 19th (Tue) to allow time to drive to Coimbra. Venture out of the city with trips to Nazare (Mercado Municipal de Nazare, Miradouro do Suberco, & more). There's lots more to do: take in nature's colorful creations at Jardim Botanico, steep yourself in history at Igreja e Mosteiro da Santa Cruz, don't miss a visit to Universidade de Coimbra Alta & Sofia, and relax and rejuvenate at some of the top local wellness centers. For photos, ratings, where to stay, and other tourist information, go to the Coimbra trip itinerary planner. Traveling by car from Evora to Coimbra takes 3 hours. Alternatively, you can take a train; or take a bus. In November, daily temperatures in Coimbra can reach 20°C, while at night they dip to 9°C. Wrap up your sightseeing on the 23rd (Sat) to allow time to take a train to Porto. Dedicate the 25th (Mon) to wine at some of the top wineries in the area. There's much more to do: take in the views from Ponte de Dom Luis I, get the lay of the land with Walking tours, don't miss a visit to Estadio do Dragao, and browse the collection at Livraria Lello. To find photos, other places to visit, more things to do, and tourist information, read our Porto trip tool . Take a train from Coimbra to Porto in an hour. Alternatively, you can drive; or take a bus. In November, plan for daily highs up to 20°C, and evening lows to 10°C. You'll have a few hours on the 30th (Sat) to wrap things up before traveling home.